Search Results for "girl stethoscope"
Portrait of pretty smiling girl close up. Young brunette woman with long hair looking in the camera holding stethoscope. Portrait of beautiful smiling girl close up. Young brunette woman with long hair looking in the camera holding stethoscope. A female pediatrician examines a little crying girl with a stethoscope in the hospital. A young mother with a little daughter at a doctor's appointment, the child is afraid of the doctor. Asian doctor girl using red stethoscope with pet doll while playing at home. 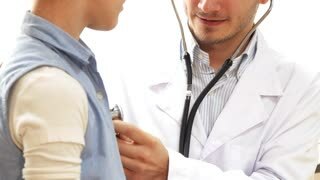 Asian doctor using stethoscope with girl in clinic, healthy concept. Pediatrician examines baby girl. Doctor using a stethoscope to listen to baby's chest checking heart beat and lungs. 1960s: Vocational high school, girl operates sewing machine, sews by hand, folds pattern. Nursing class, girls use blood pressure cuff and stethoscope. Boy nods, raises eyebrows. Male doctor examines baby with a stethoscope. Young mother holding baby girl while pediatrician listens to her chest in his office at the hospital. 4K footage. A young cute female doctor examines a little girl with a stethoscope in the hospital, a girl is crying loudly while sitting at Mom's hands. Female pediatrician at the clinic advised the girl, Pediatrician woman inspects little girl with a stethoscope. The concept of scene: doctor's office, doctor and patient talk and discuss the results, health care, medical advice, review.